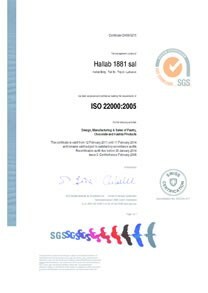 A quality management system, based on ISO 9001:2015, and covers all processes and activities in the organization from the design, manufacturing and sales of pastry, chocolate, Kashta, ice cream and oriental sweets. A food safety management system, based on ISO 22000:2005, covers all processes and activities in the organization from the design, manufacturing and sales of pastry, chocolate, Kashta and Ice Cream products. Maintaining our position as the leader in the oriental sweets market. Creating a culture around our oriental sweets produced in the region and globally. Aiming to develop a trusting long-term relationship with our customers through the understanding of their needs and ensuring their satisfaction. 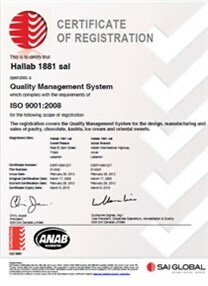 Making sure that our products, services and processes comply with the Lebanese and international regulations. Providing the necessary resources, infrastructure, equipments to apply strict good hygiene and manufacturing practices (GHPs & GMPs), specific monitoring control measures, and ongoing verification to make sure our products abide by our standards. Developing staff competencies, creativity, empowerment and accountability through appropriate development programs and show strong management involvement and commitment. We engage our people in achieving the required yearly objectives; we encourage them to understand the customer requirements and to work upon them, as well as to share their knowledge with their subordinates. Supporting the ongoing research and use of best practices at all levels to ensure reliable risk management and prevention. Each member of our team is responsible for fully satisfying our customers by exceeding their needs and expectations with best-in- class products and services. ISO 22000:2005 specifics requirements for a food safety management system where the organization in the food chain demonstrate its ability to control food safety hazards in order to ensure that food is safe at the time of human consumption. ISO 9001:2015 standards give the organization an opportunity to increase value to its activities and to improve its performance continually, by focusing on the major processes. The standards place great emphasis on making quality management systems closer to the processes of the organizations and on its continual improvement including customer satisfaction.